Italy holds one-third of the world’s historic churches, castles, statues and monuments. One of Italy’s national parks is the picturesque Cinque Terre. In addition, the country offers 127 regional parks and expansive protected nature preserves for picnics, biking and camping. It will take many visits, hopefully over a lifetime, to explore and get to know La Repubblica Italiana in its fullness. Even after dozens of visits here, there’s still more to discover. Italy is historic, timeless, and enchanting. There is a feast or celebration for every popular saint (each town has a patron saint), and Italy hosts hundreds of concerts and events. Do some research, and ask at your hotels to see which ones can add special memories to your Italian adventures. Most visitors to Italy will take two or three weeks on their first trip to see Rome, Florence, and Venice but try also to get off the beaten path and experience something more than the basic tours. We offer the following recommendations for Italian restaurants, hotels, movies, recipes from actress Sophia Loren, and beloved Italian-American Paul Locatelli, former President of Santa Clara University. Owners: The charming and engaging Alfonso, Livia, sons Mario and Ernesto Iaccarino treat their guests like family. The restaurant occupies the central building and is surrounded by five luxurious suites for their guests to stay in. Coveted Michelin three red forks and two stars! Michelin says, “A hospitable cuisine, with good imaginative touches and an ability to make the best use of local produce; a clever variation when creating country style menus. Baby squid with local cheese stuffing and grilled pepper purée with wild fennel seed (spring­autumn). Maria Orsini Natale’s rigatoni Vesuvius. Neapolitan millefeuille with sour cherry sauce.” Closed 7 January – 15 March and November and lunchtime June to September. Mario is known for taking customers for a ride in his red Alfa Romeo sports car. Inside Castello di Biagiano.Via San Pietro Campagna 32, Assisi tel.075 816379. Near thePiazza del Comune, Assisi tel. 075 812649; closed Tuesdays. Via Eremo delle Carceri 8, Assisi. tel. 075 812317 e 813636. Near Santa Maria degli Angeli Basilica,Via Patrono d'Italia 48 Tel.075.8040867 & 8040221. To-die-for Calamari. Divino Trofiette al pesto (Short, handmade Ligurian pasta with pesto, olive oil and garlic), steamed muscles and other assorted fresh seafood from the sea only 30 feet away. Meringue dessert with chocolate is delectable. Beautiful view of the sea, town of Camogli and the church. Owner: Roberto. Chef: Salvatore. Michelin two forks. Spectacular view from this house overlooking the sea, with a veranda, built around a tree, and the terrace for service in summer; Ligurian and fish dishes. Authentic pesto pasta and seafood specialties. The friendly owner, Egidio is a talented chef, ambassador extraordinaire and he serves as the head of the province’s gastronomic society. Michelin one fork. Not easy to reach but located in an enviable, priceless spot between the mountain at Portofino and San Fruttuoso Bay. A haunt for lovers of Ligurian cuisine and seafood. Located on walk through charming town of Castellina in Chianti—you can’t miss it because the village is small. Marco Beptio can arrange a memorable wine tasting. Be sure to see the lower level with historic vintages of Chianti since 1945. Wine tastings available. Popular with locals for excellent pizza. What a treat to discover Bruno’s Terra Rosa, a quaint wine bar where he prepares mouthwatering appetizers such as bread with fresh anchovies, black olive spread and sun-dried tomatoes paired with delectable wines which are produced in Corniglia and the other four wondrous Cinque Terre towns. There are seven stools for the guests who are fortunate to arrive first and the others who savored the Ligurian vino’s while standing didn’t seem to mind given Bruno’s warm hospitality and the delicious appetizers he served. Owner Marino Cinali. Founded by Signora Gina in the early 1950’s. Outstanding Tuscan trattoria. Cross the Arno at the Ponte Vecchio and turn right into Borgo San Jacopo. Housed in a 15th century palace with vaulted ceilings. A native of Genoa, Giampaolo Belloni di Zeffirino, presents sumptuous menu selections that the famous Zeffirino in Genoa, Italy is known for. Since 1939, the staff at Zeffirino has gained universal recognition and merits for their great culinary skill including the introduction of pesto sauce all around the world. Guests such as Frank Sinatra, Liza Minelli, Burt Lancaster and even Pope John Paul II have dined and enjoyed the culinary specialties at Zeffirino’s. Owners: Luciano and Rossella. Specialties: melanzane – eggplant, Papparadelle with wild boar sauce, Stracotto with Chianti Classico, Ribollita and tiramisu. Fried zucchini flowers when in season. St. Francis of Assisi domesticated the wolf of Gubbio and as the legend tells, the same wolf used to come and have lunch at the Taverna del Lupo. It may just be people’s imagination, but the magical atmosphere of the past times is an integral part of the Taverna experience. Rodolfo Mencarelli and his wife Lisetta believe in authentic regional cooking. The scrumptious truffles from Umbria are the main protagonists along with the best home made pasta and selected local meats. Rodolfo, Lisetta, Rosella, Franca and Claudio all provide excellent service and prepare some of Umbria’s most authentic Italian cuisine. Michelin three forks. Michelin adds, “Historic establishment in the heart of Gubbio, linked to St. Francis and the fierce wolf, for a historical couple of dining rooms; age old environment and succulent cuisine.” Closed on Mondays except August, September and holidays. 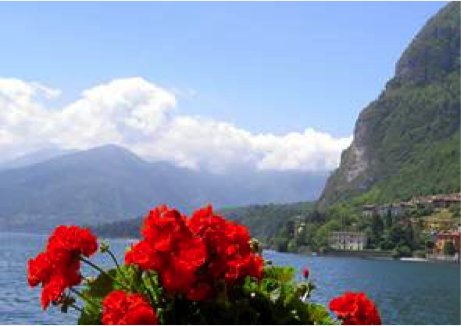 The Grand Hotel Serbelloni is set in Lake Como’s jewel of Bellagio. Rooms are deluxe and senior suites are sumptuous. First class dining. Violin and piano music most evenings in the elegant lounge. The Grand Hotel Imperiale looks on to Lake Como in Moltrasio. A peaceful resort on the slopes of Mount Bisbino. Its privileged position, in one of the spots where the lake is at its narrowest, offers a wide and breathtaking view of the Lario and its prestigious villas. Best Western property. Resort setting with pool. Comfortable rooms. Excellent restaurant with live entertainment at night during the summer. Best Western property. Outstanding homemade pastas and fresh seafood. 15 minutes from Le Torri del Garda. In quaint town near port and castle. Fresh fish and seafood specialties as well as marvelous pizza. Closed Wednesdays. Open 11am-3pm & 5:30-11:30pm. Lido di Camaiore and adjacent town of Viareggio are resorts on the popular Versilia Riviera. Owner Leonello Falomi. The Hotel Eur is located in a small park with pool. Two blocks from the sea and main walkway with dozens of beachfront restaurants and solariums where you can rent spaces to relax under a parasol. One of the best beachfront relaxation spots, a 5 minute walk from Hotel Eur, is Sole, Lungomare Europa 124, Lido di Camaiore. Tel./FAX 0584.617991. Founded by Oreste. His son Walter runs this favorite dining establishment of Luciano Pavarotti in his hometown. Michelin two forks. Divino pumpkin ravioli and tortelloni served with a pomodoro sauce. Try the Nocino (Made from noce—walnut in Modena, Assisi and other areas throughout Italy) as a digestive-- after lunch or dinner drink. Closed 10-31 July, for Christmas week and Sunday evenings and on Wednesdays. Michelin recommended. Gorgeous views. Located at the gates of Montalcino. The largest, most delicate and delicious hand-made ravioli. Beautiful view. Near Vecchia Oliviera Hotel. Michelin one fork. Delectable Umbrian specialties. Excellent wine list and well-stocked enoteca. Spa and thermal pools. First-rate restaurant. Beautiful park setting. Mirco Olivieri also offers Parma ham and balsamic vinegar tours. Cheese tours given Monday through Friday starting at 8am—cheese is only made when it’s cooler in the mornings. You will see by the restaurant recommendations, all in or near Perugia’s town center, that this medieval town is cosmopolitan and eclectic (i.e. eight Chinese food restaurants). Grand deluxe hotel built in 1884. Across from main Piazza della Repubblica with huge equestrian statue of King Vittorio Emanuele II where the famous passegiata (walkway) of Corso Vannucci begins. Guests have included Queen Mother of England and Prince Ranier of Monaco. Great service. Warm, comfortable atmosphere. Owner Marwan and head chef Mohammad are both from Palestine. Authentic giros, babaganosh, tabouleh, falafel, fresh hummus (ground ceci or garbanzo beans) couscous, baklava and many other Middle Eastern specialties. Near Cathedral of San Lorenzo and Piazza Matteotti. Open 11am to midnight. San Sisto – Perugia E45 at Madonna Alta exit. Open Monday through Friday 8:30am-1pm & 2-5:30pm. Free admission. Tasting is part of the tour. Huge selection of chocolates for purchase after the tour. The Italian Royal Family, Mussolini, Joe DiMaggio and many other VIP’s have toured the Perugina Factory. Enjoy and buon appetito! Pietro Vannucci, namesake of Corso Vannucci also called “Il Perugino” – The Perugian. He was one of Raphael’s teachers and is considered one of Italy’s most gifted painters. Perugia, Italy Tel. 075 5741247. Features artwork of Duccio, Perugino, Fra Angelico, Piero della Francesca, Arnolfo di Cambio, the Master of St. Francis, Gentile di Fabriano, Orazio Gentileschi and Pietro di Cortona. Università per Stranieri Perugia -- University for Foreigners Perugia, is the oldest and most prestigious Italian institution involved in teaching of the Italian language and civilization in all expressions. They offer excellent one to three month immersion courses. Originally built by Napoleon in 1810 as a fort. Unique and spectacular setting next to the sea. Luxurious rooms with all modern amenities. The dining room and bar are nestled in a 200-year-old stone garrison within the former fort. Outstanding menu and service. The Royal suite is the closest to the sea and has a second level patio which overlooks the waves below. Piano and singing most evenings. Portovenere is one of the most romantic harbors on the Ligurian coast, a maritime village between Cinque Terre and the Gulf of Poets where its tall, multi-colored houses are reflected in the clear waters of the Mediterranean Sea. It is in this setting that the Grand Hotel Portovenere, an ancient Franciscan monastery from the year 1600, is located. There are 44 rooms and 10 suites, many of them with splendid balconies overlooking the sea. Highly recommended restaurant and plentiful breakfast buffet. The charming and talented chef-owner Antonio and his family provide some of the Ligurian coast’s most breathtakingly good seafood and pasta. Antonio’s Trofiette (handmade pasta typical on the Ligurian coast) with fresh pesto (basilico, garlic and pine nuts with olive oil) is an 11 on a 10 scale! The platter of large, black muscles are a must as an appetizer—fresh and sweet, these delicacies are served in a broth with olive oil, parsley and garlic. Simply sublime. Local white wines are recommended. Warm and friendly service. All of this only a few steps away from the harbor with sea views. A truly unforgettable experience! Closed Thursdays. Built in the late 1800’s in a palace in the heart of Rome and recently renovated, the hotel Bernini Bristol offers the glamor of a bygone era along with the most modern appurtenances and amenities. Its ample salons are enchanting with their period furnishings and tapestries, as are its rooms marked by a refined atmosphere and comfortable elegance. L’Olimpo rooftop restaurant is located in the highest spot in the heart of the Eternal city. L’Olimpo offers its clients a breathtaking 360° panoramic view of Rome. Clients can enjoy a splendid view while savouring delicious Mediterranean and international cuisine. Close to Via Veneto. Michelin rates this a coveted four red forks and a star and adds, “Return to the past splendour of worldly Rome. This stylishly decorated 15th Century building features a restaurant, piano bar and disco. Specialties: rice, peas and scallops. Ewe’s milk cheese ravioli with delicate lamb ragout. Chicken alla Romana. Hotel Sovestro, run by the Failli family, is located in the heart of the Tuscan countryside, 2 km from San Gimignano (Poggibonsi - San Gimignano road) and is ideal for a fully relaxing holiday. Two swimming pools, one with whirlpool. Authentic Tuscan cuisine at their Ristorante Da Pode. A small restored castle with beautiful views of the port city of Santa Margherita Ligure. Reasonably priced. Driveway up to the castle is an adventure. Outstanding seafood and pastas. Located near port with views of sea and statue of Cristoforo Colombo. Even the air of the World-class San Domenico Hotel is redolent with the unique history of the surroundings. Built around a monastery dating from the year 1400, with the original structure still intact, it is surrounded by a garden filled all year round with flowers of rare beauty. Spectacular views of the sea. Michelin recommended . While in Taormina be sure to visit the town of Castelmola located above Taormina. Located in center of historic Todi. Authentic pizza and pasta. Set in a restored medieval village with a castle. Panoramic views. Ristorante Il Pavone is outstanding. General Manager Federico Pitaluga. Michelin recommended. Pool and fitness room. Beautiful views. Seven miles from Deruta. The San Domenico Hotel is a group of old monastery buildings dating from the 14th century set in the main square of Urbino, directly in front of the Ducal Palace. It stands between the Cathedral and the University. The old church, with its lunette of Luca della Robbia and its magnificent paintings, is truly spectacular. The sixteenth-century rooms of the adjacent convent have been converted into comfortable, quiet rooms and welcoming, characteristic lounges, all rich in charm. Marvelous breakfast buffet. A few minutes walk to main square with fountain that is the meeting place for locals, thriving with activity and a market with local producers and vintners. Watching the people here, as in all Italian piazzas, is a joy. Three different types of grilled polenta, tortellini burro e salvia, Risotto all’Amarone (Rice with Amarone wine), penette all’arrabbiata (small penne pasta with spicy pomodoro sauce), steak of horse and tartufo bianco (white truffle ice cream) for dessert are all delectable. Ask to see the marvelous wine cellar. Excellent wine list. Owner Pietro Leopoldo Ramponi is a gourmand extraordinaire and a Slow Food supporter. Michelin one fork. Closed Sundays. “When Pride Still Mattered—The Life of Vince Lombardi” by David Maraniss 1999, p.18. Vincenzo Tomaso Lombardi (11 June 1913- 3 September 1970), the son of Matilda Izzo & Enrico Lombardi who lived in Sheepshead Bay section of Brooklyn, NY. Compliments of Marco Aurelio Alfredo Falzetti, Deruta & Irma Pretta, Sardegna. It describes a fricassee of 17 sweet and sour ingredients, such as mullet, brains, honey, vinegar, pickles, marrow, and ouzo. 4 anchovy fillets, rinsed patted dry and chopped. With a food processor running, drop in garlic and finely chop. Stop motor and add parsley, onion, anchovies, olives, capers, salt and pepper, then process until finely chopped. With motor running add ½ cup oil, blending until incorporated. Cook pasta in a 6 to 8 quart pot of boiling salted water until al dente. Drain well in a colander then return to pot and toss with remaining 1 teaspoon oil. Transfer pasta to a large serving bowl, then pour sauce over top and toss well. Serve immediately. Freshly grated Parmesan for topping. Bring broth to a slow, steady simmer. In a separate heavy 3-quart pot, add 3 tablespoons butter and all the oil. Over medium-high heat, sauté onion and garlic until onion becomes translucent. Add rice, and stir until well-coated. Sauté rice, onion, and garlic lightly for a minute or so, then add 1/2 cup simmering broth; cook, stirring, until liquid is absorbed. As rice dries out, add another 1/2 cup simmering broth; continue to cook, stirring. Add broth as needed for about 15 minutes, stirring constantly to cook rice evenly and prevent it from hardening and sticking to bottom of pot. Add mushrooms; continue cooking and stirring. Correct heat is very important in making risotto -- a slow simmer is ideal. Risotto is ready when the rice is tender and moist but al dente. Taste to determine if salt is needed -- the beef broth is usually sufficiently salty. Add a few twists of pepper to taste, and turn off heat. Add the remaining 2 tablespoons butter and the 1/4 cup grated Parmesan cheese. Mix thoroughly. Spoon onto a hot platter or into individual bowls; offer more freshly grated Parmesan as topping. The basic recipe for this sauce is one that I learned from my mother who not only made her own sauces but also spaghetti, ravioli and gnocchi. 2 tablespoons or so chopped fresh Herbs: rosemary/parsley and sage or basil Pepper and Salt to taste. Warm olive oil and sauté onions until translucent or golden. Add tomatoes with juice and herbs, either the rosemary/parsley/sage mix or basil. Cover and simmer for about an hour. (My mother would “simmer” sauces for 4 or 5 hours over very low heat) Stir frequently. (Optional) mash the mixture to get a “fine” texture and cook for a few minutes to reduce. For a “creamy” texture, slowly stir in a little milk or half & half during the last 10 or so minutes of simmering -- or until the mix evaporates. For “fuller body” flavor, stir in ½ cup or more of dry white wine at the beginning or, at least, during the last 30 minutes of simmering. Both bouillon and wine can be added to the same sauce, but I would not recommend adding any salt since the bouillon already has salt. For garlic lovers, a couple of cloves (finely chopped) may be added. Garlic should be sautéed with the onions. For a “Bolognese” type sauce, add ground beef; brown the beef by adding it to the sautéed onion and/or onion and garlic. Then add the tomatoes and follow the above directions. Note: Ingredients and measures are relative to taste. The simplest of these variations would consist of olive oil, onions, tomatoes, and one of the spices (rosemary or basil, for example) with salt and pepper to taste. For example, adding garlic or wine or beef bouillon is not mutually exclusive, but adding only one of these is an option. Cook chopped garlic in olive oil for about 5 minutes. Mix fresh basil, spinach, garlic, butter, pine nuts and olive oil. Add a very little salt or none at all and pepper to taste (people can always add their own salt to taste). Add some of the grated cheese, but do not let the pesto get too “thick”. Cook the pasta al dente, drain and return to pot, add pesto and mix pour into bowl and sprinkle Romano and parmesan grated cheese over the top. You can use any kind of pasta: linguini, angel hair, gnocchi, ravioli, etc. ROASTED CHICKEN alla Padre Pietro Filice, S.J. Combine mustard, oil, thyme, rosemary, basil and garlic in small bowl. Set mixture aside. Pat chicken dry. Using fingers carefully separate skin from meat, starting at top of breast and working down to thigh area. Rub half of mustard mixture over meat under loosened skin. Season cavity with salt and pepper. Place some garlic in cavity if desired. Tuck in wings. Tie legs together to hold shape. Spread remaining mustard mixture over chicken. Season with salt and pepper. Tent with foil and refrigerate overnight. Position rack in center of oven and preheat to 450 degrees Fahrenheit. Line roasting pan with foil. Place chicken breast side up in pan. Bake uncovered until juices run clear when thigh is pierced, about 55 minutes. Cut string from legs. Let chicken stand 10 minutes, then serve. *Peter Filice, S.J., Jesuit Community at SCU, adapted this recipe from Bon Appetite and he cooked it often with Fr. Paul Locatelli. Domenica is a wonderful Sardinian woman who appreciated excellent food and loves preparing superb feasts – not simple meals. Friends invited eight people to visit them in Sardinia where on 8 August 1998 Domenica prepared a feast consisting of twelve antipasti, gnocchi for the primi, and a roast piglet, crayfish, scampi, and a whole sea bass for the secondi. We were too full to have – enjoy – her dessert. One of the antipasti was Eggplant alla Domenica. Note: quantities depend on the number of people – two slices would be sufficient for most people. Brush a little olive oil on both sides of the eggplant and place in a flat roasting dish. Salt to taste – note that the anchovy are salty. Preheat oven to 375 and cook for 6 to 8 minutes. Another wonderful and wonderfully simple dish was Domenica’s zucchini and potatoes dish. Note: quantities depend on the number of people to be served. It should also be noted that Italians use a “hint” of sauces and spices, just enough to enhance the natural flavors, compared to Americans. Hence, I suggest not using a large amount of the parsley/garlic mix. Mix together parsley, garlic and salt. In a non-stick pan, cover the bottom (lightly) with EVOO. In layers, (a) zucchini, (b) potatoes, and (c) parsley/garlic mix. The parsley/garlic mix should be “light,” Italians do not overdo spice. Repeat 2 or 3 more layers. Preheat oven to 375 and cook for 20 minutes. Ready to serve. Cut butter into flour as you would for pie crust by hand or in a quisinart. Transfer into large bowl. Add eggs and sherry and mix thoroughly. Roll dough into 6 equal size loaves of approximately 1 inch by 1 ½ inches and 12 inches in lengthen and bake at 350 F for approximately 20 minutes – until firm but not dark. After baking, slick into “biscotti” sizes, lay the slices on edge in a pan, and then toast for 12 – 15 minutes. *Biscotti recipe from Howard Major, chef and manager for the Jesuit Community at SCU. Fr. Paul Locatelli is treasured by friends for his leadership as President of Santa Clara University, spiritual guidance, early morning jogs, lively conversations and his Mamma Locatelli’s recipes which he loved to cook. Produced in 1989 by Giuseppe Tornatore. A masterpiece of the Italian cinema. “Cinema Paradiso” - the themes for this beautiful Oscar-winning film are touched with a wistful nostalgia – Ennio Morricone’s son Andrea Morricone, who also conducts concerts of his father's work, composed the love theme. A celebration of youth, friendship, and the everlasting magic of the movies. A filmmaker recalls his childhood, when he fell in love with the movies at his village's theater and formed a deep friendship with the theater's projectionist. Starring Marco Leonardi, Jacques Perrin, Antonella Attili, Pupella Maggio, Phillipe Noiret and Leopoldo Trieste. Nominated for five Academy Awards. “Il Postino” (“The Postman”), is a charming piece of cinema that takes several comfortable formulas and expands upon them in ingenious and emotionally-satisfying ways. There's a little of everything here: poetry, politics, humor, love and heartbreak. Best of all, these elements flow together seamlessly in a production characterized by solid acting, balanced pacing and eye-catching cinematography. Produced in 1995 by Mario and Vittoio Cecchi Gori and Gaetano Daniele. Starring Massimo Troisi, Philippe Noiret, Maria Grazia Cucinotta and Linda Moretti. Also recommended: Roberto Benigni’s “La Vita E Bella” (“Life Is Beautiful”), “Bicycle Thief”, Totò’s comedies, Giovanni Guerreschi’s classic “Don Camillo” films, Federico Fellini’s “La Strada” and many others. Travel in first-class comfort. A once in a lifetime experience. Daily ferries with car. Sleeping cabins available. The Romans called this game "micare digitis" and “micatio” (twinkling fingers). In Italy, this game is played loudly and with passion. Centuries ago in the town of Massa, close to the marble mines of Carrara, this game was imported by woodmans and coal dealers from the northern regions. It was played at home or at some inn with good wine. Also called “La Morra”. In Sardegna the game is called “Su Murra” or “Murra”. The Sardinian Morra Championships, which have become the championships for morra players in Europe, are held every August in Urzulei, Sardegna. Have you ever been to a picnic or social gathering and seen a group of people yelling and throwing fingers at each other? Did you ever wonder what exactly they were doing? Believe it or not they were enjoying a game of morra which just so happens to be a game that can be traced back to Roman times. When I first watched my Dad play I thought wow, my Dad is playing Rock, Paper, Scissors. I knew how to play this game, but the more I watched the more I realized that the game they were playing was not quite as easy as Rock, Paper, Scissors. In my game I just had three choices. The more I watched the more I learned how to play and quickly I too was able to participate in a game of morra. Guess the total number of fingers extended by you and your opponent. Determine how many rounds a person must guess correctly in order to win the match. Start the game by having the two players face each other. The hand that you are using generally remains visible to your opponent and the other hand is usually placed to the side or behind your back. Either at the count of three or some sort of predetermined signal the players extend their fingers and shout out a number from zero to ten. The fingers are counted to see if anyone guessed the total number of fingers correctly. If one of the players guessed correctly that person wins the round. If no one guessed the right number then neither player wins that round. If they both guessed the correct answer then it is a draw and neither gets credit for winning the round. Play continues until one of the players reaches the number needed to win the match. Note: Zero is represented by extending your hand and making a fist. The rules for this game are not that difficult. All you need is to find someone to play against and you are ready to go. The next time you’re at a family gathering you won't have to sit and watch. You will be able to join in on the fun and show them just how good you are. For many of us, morra was more than just a game. It was an opportunity to learn yet another Italian tradition from our father, grandfather or another family member. By taking an interest and learning how to play, we help to keep the traditions of our family and our heritage from being forgotten. John Rotola, (beloved husband of Nora, father of Carol Rotola Hardcastle and grandfather of Suzette, Chris and Andrea) of Denver, Colorado who taught Davide Primo and Bert T. Hardcastle III the fine art of playing La Morra at the Potenza Lodge. Learn zero to ten in Italian so you can play La Morra. Enjoy!